Here is my roundup of 2018’s most luxe fall trends on my radar that I adore and many of my weddings this season will incorporate. The flower crown certainly has not disappeared, especially with the insurgence of boho style. 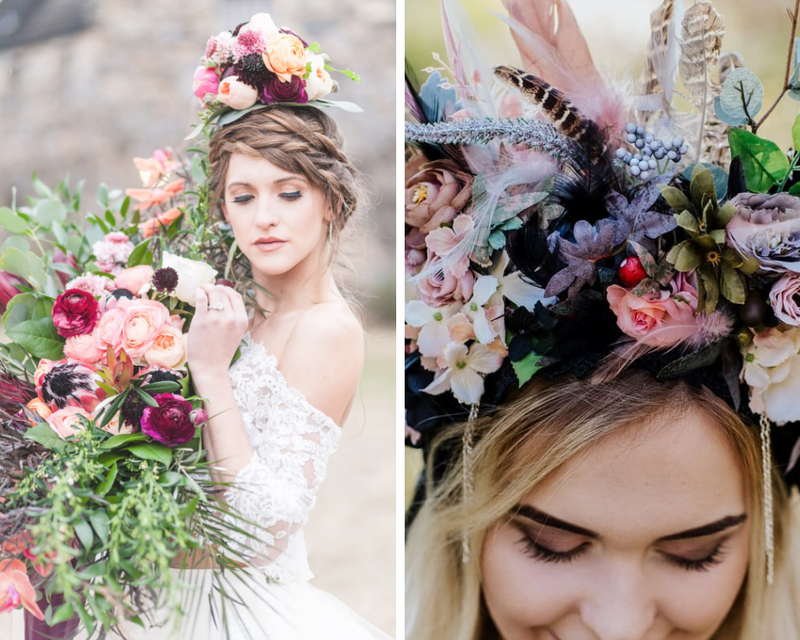 However, brides have begun opting for something a bit more sophisticated in regards to design in the way of clips or over-sized floral hair wreaths and crowns. Large buds like peonies exude opulence while still remaining on trend via the “bohemian” route. Add feathers for a truly unique vibe like this one from LaCrown. Fall weather conjures up feelings of warm lattes with cinnamon and pumpkin bread. Signature cocktails can be so fun and memorable when the season is taken into account. Think deep, rich colors, warm drink options and incorporating fall foods like apples, oranges and berries. We posted a recipe for an Autumn Sangria here along with signature drink name options. What cocktails come to mind when you dream about this season? Couples are stepping outside the box when it comes to wedding arches. These circular statement pieces are not only gorgeous, but very feng shui. When used outdoors, it creates a frame for your venue’s backdrop. Hoops and stands are available online in Etsy stores or even Hobby Lobby. We love these options, above from Etsy shop, Vow Wow Decor! Fill them with greenery and florals or opt for a crescent moon design (another 2018 trend of celestial details, see below). (Left) Photo provided by Paper moon Shoppe. (Right) Photo provided by Couture by Tess Bridal. A big trend predicted for 2018 was “celestial bodies.” All the moon, stars and galaxy details have been mixed into everything from tablescapes to wedding gowns. Uplighting your venue space with stars or using fairy lights to create the ambiance of a night sky is all the rage. Why not try a luxe wedding gown like the one above by Couture by Tess Bridal, which is illuminated with galactic starshine all across the lace bodice and skirt? Give your signature drinks a celestial name and scatter candles everywhere. Or try one of Paper Moon Shoppe’s gorgeous moon or sun props useful for photo booths or backdrops for your altar. They even offer Moravian Hanging Stars…the sky is the limit! Unusual shapes that resemble a sculptural art piece in moody colors are cropping up everywhere from the runway to the bridal bouquet. For years now burgundy has dominated the fall wedding floral color palette, but this year we will see more actual deep purples than reds, burnt oranges and different takes on “pink.” Say good-bye to eucalyptus (thank goodness) and hello to darker greenery with multiple textures. (Left) Photo by Elizabeth Hoard Photography. Pass hors d'oeuvres during cocktail hour have become increasingly popular. 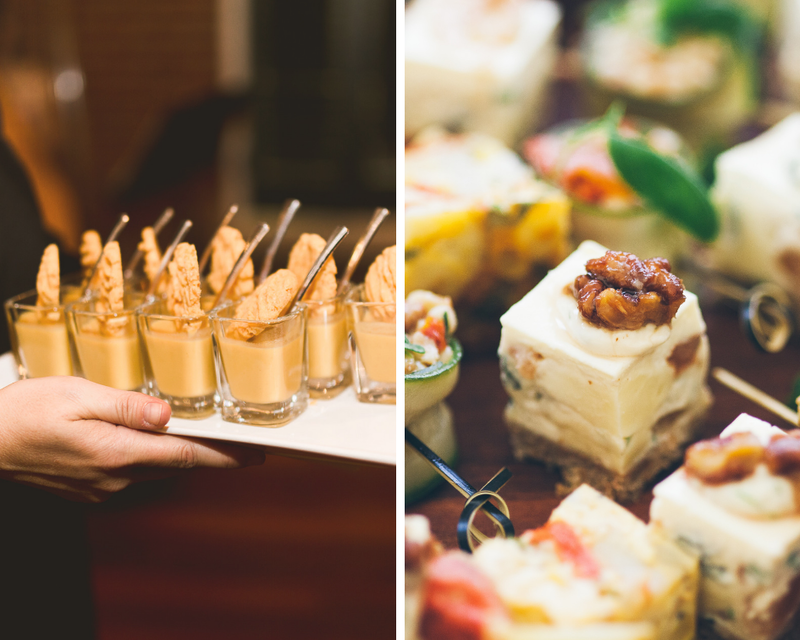 Since more and more couples are opting for buffet-style dinners, pass hors d'euvres during cocktail hour can give your wedding that special one-on-one food service that your guests may not get during dinner. During the autumn months, cozy, comfort foods dressed in “all the fall things” like pumpkin puree, pecans and cinnamon can create such a warm and inviting feel to your event. Some great examples are bacon-wrapped water chestnuts, pecan bite-sized cheesecake, fig and blue cheese thumbprint cookies, and persimmon bruschetta.